Sujaya Foundation is a Maharashtra-based non-profit organization that helps bridge the gap between education & employment, through their three main programs - Sujaya English Active Learning (SEAL) program, Computer classes and Experiential Learning Program (ELP) for the differently abled. The founder Ms. Neelambari Rao understands the importance of spoken English in today’s times. This led to the creation of innovative self-guided learning tools for schools such as crosswords, matching similar words and quizzes, in the absence of adequate teachers. This method is also helping their students acquire basic computer skills. In 2008, Sujaya Foundation had signed a contract with HDFC Bank for providing data entry jobs for disabled youth, as part of a three-month internship program. Sujaya Foundation is keen to replicate its ELP model in other parts of India. Sujaya Foundation will be expanding its SEAL program currently from 3 centers in Maharashtra to 10 centers which includes a few schools in Rajasthan & Karnataka. Sujaya Foundation is currently working with Municipal Schools and Magic Bus for providing computer related training. This is a three-month course, provided at a discounted rate of Rs50 per month, catering to the age group of 12 years to 40 years. In FY13, 537 students have benefited from this program. At present, the SEAL program caters to 880 students, teaching them English, Science & Math. In FY13, 56 differently abled youth have benefited from the ELP. Sujaya Foundation receives 11 paise per data entry from their corporate partners, and they share 9 paise with the disabled youth. Since 2008, 11 trainees have been successfully placed in various corporates, after completing their internship. Total income on Y-o-Y basis rose steadily by 37% in FY13 to Rs15m, due to higher contribution from the trustees and also increased level of confidence, among corporates & foreign donors. Income from Data entry charges rose from Rs0.7m in FY12 to Rs1.05m in FY13, up 38.5% Y-o-Y. Out of the total expenditure in FY13, 54% was spent on program staff cost, which is in-line with the 4 year average of 52%. The relatively higher expense on program staff cost is justified, as the NGO works in the education sector. We have compared Sujaya Foundation with 4 other NGOs in the same space, with FY13 Incomes between Rs10m to Rs20m - Each One Teach One, SAPREM (Social Aspiration for Participatory Reforms by Evolved Manpower), Masoom and Vidya & Child. In FY13, Sujaya spent 94% of its total expenditure on direct program expenses, which is higher than the average of 80% of the other four. 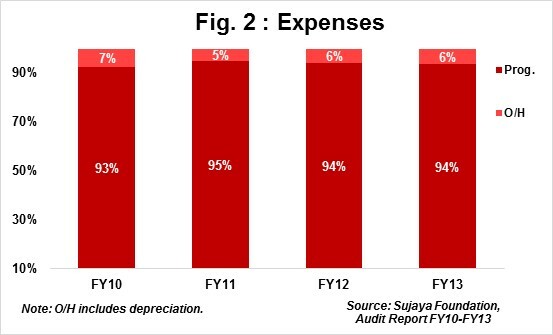 Overhead expenses of Sujaya at 2% were the lowest in comparison. Fixed Assets of Sujaya were thelowest amongst the five NGOs, as Sujaya does not have its own property. 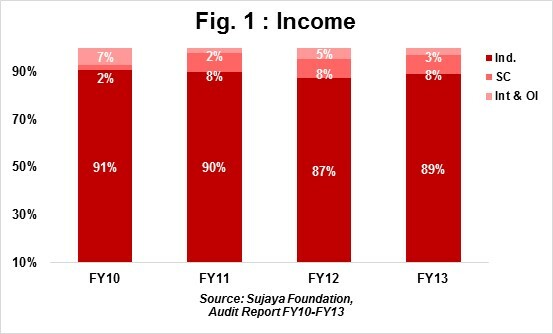 Sujaya Foundation has posted a 4-year income CAGR of 48%, during FY10-13. The increase is mainly due to the regular contribution made by one of the Trustees - Mr. Jaithirth Rao in all four years. Self Sufficiency Ratio (SSR) has improved marginally from 114% in FY12 to 120% in FY13. It has been above 100%, since FY10. SSR measures how much of expense can be met from own Income – individual donations/corpus income/fee income. Partners: Supporters include HDFC Bank, Global Fund for Children, Each One Teach One, ICICI Bank, Deutsche Bank, Tata Motors, NSEIT, Societe Generale, State Street Foundation and others. Space constraint. Sujaya’s head office is currently located in one of Mumbai’s prime locations. The monthly rental is more than Rs200,000 reducing their overall spend on beneficiaries. The organization is looking for another location where the rentals are comparatively lower. In addition to this, the current center accommodates only 35 interns under the ELP programme, limiting the scope to support more differently abled individuals. Under its ELP, disabled persons are only trained for data entry jobs; this may limit their capabilities & job opportunities. Sujaya Foundation should seek other corporate partners to expand the potential job opportunities they offer. Sujaya Foundation could consider widening its sources of income as a large part of their income is received from one of its trustees. Sujaya is among the well-known and professionally run non-profits in Mumbai, backed by strong board of trustees. The trustees are veterans from diverse fields like Financial Services, Pharma, IT and others. The Board consists of seven members, all of whom are actively involved in Sujaya’s programs. They also participate in the quarterly board meetings. Minutes of the meeting are well documented and circulated to all members. Founding member, Ms. Neelambari Store Rao has worked in the education space for more than three decades. She spearheads the team at Sujaya and her contribution in developing content for Sujaya has truly been remarkable. Regarding Sujaya’s reporting standards, they have an in-house tool to document progress of each of its beneficiaries as well as the interns who are a part of ELP.